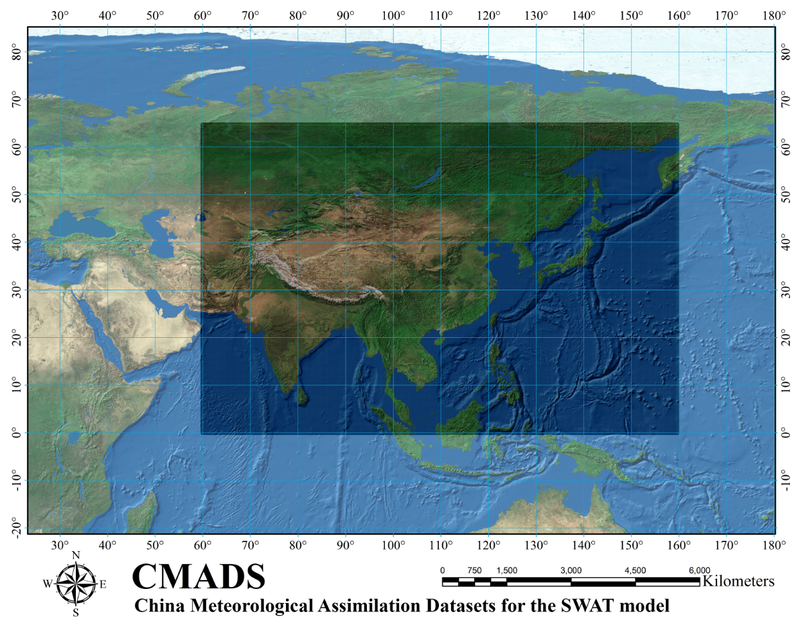 Wedescribe the construction of a very important forcing dataset of average dailysurface climate over East Asia—the China Meteorological Assimilation DrivingDatasets for the Soil and Water Assessment Toolmodel, (CMADS). Thisdataset can either drive the SWAT model or other hydrologic model, such as theVariable Infiltration Capacity model (VIC), the Soil and Water Integrated Model(SWIM),etc.. It contains several climatological elements—dailymaximum temperature (℃), daily average temperature (℃), daily minimum temperature (℃), daily average relative humidity (%), daily averagespecific humidity(g/kg), daily average wind speed (m/s), daily 24h cumulativeprecipitation (mm), daily mean surface pressure (hPa), daily average solarradiation (MJ/m2), soil temperature (K) and soil moisture (mm3/mm3). In order to suit the various resolutionsrequired for research, four versions of the CMADS datasets were created—fromCMADS V1.0 to CMADS V1.3. We have validated the source data of the CMADSdatasets using 2,421 automatic meteorological stations in China to confirm theaccuracy of this dataset. We have also formatted the dataset so as to drive theSWAT model conveniently. This dataset may have applications in hydrological modelling,agriculture, coupled hydrological and meteorological modelling, andmeteorological analysis. 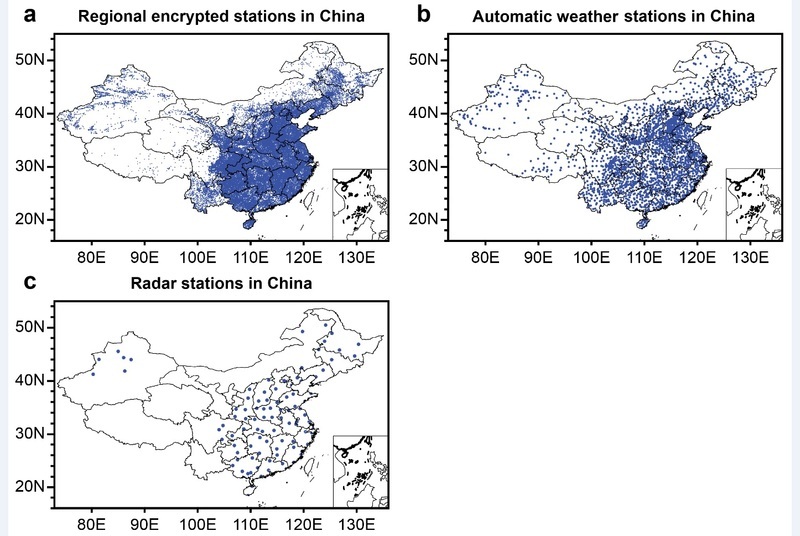 Severalimportant raw input data for the CMADS datasets (a) Regional encryptedstations, (b) National automatic stations, (c) Radar stations. 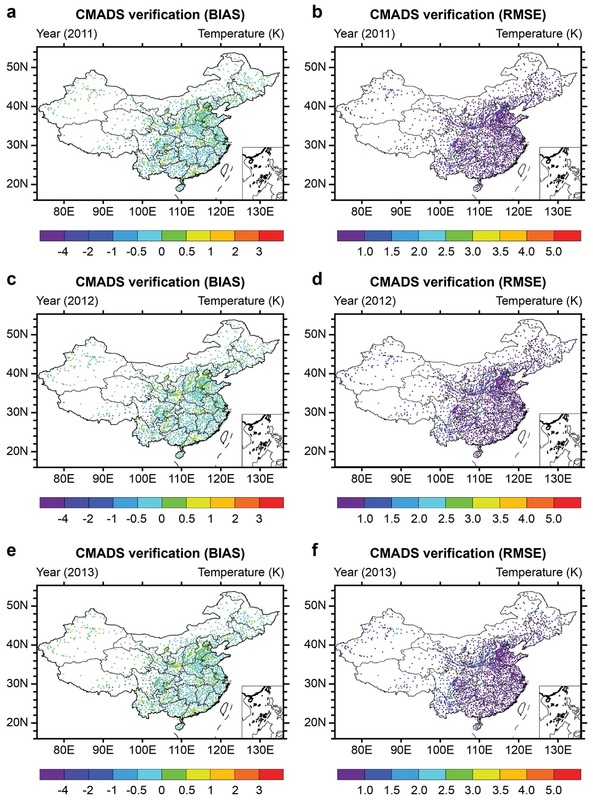 Meng, X.; Wang, H.; Shi, C.; Wu, Y.; Ji, X.Establishment and Evaluation of the China Meteorological Assimilation Driving Datasets for the SWAT Model (CMADS). Water 2018, 10, 1555.